EP-9500 is a multifunctional uninterruptible power system fishpond air pump. While conveying fishes in car, users can use automobile cigarette lighter DC power plug to power air pump and replenish oxygen in water. AC power air supply is available in two steps. 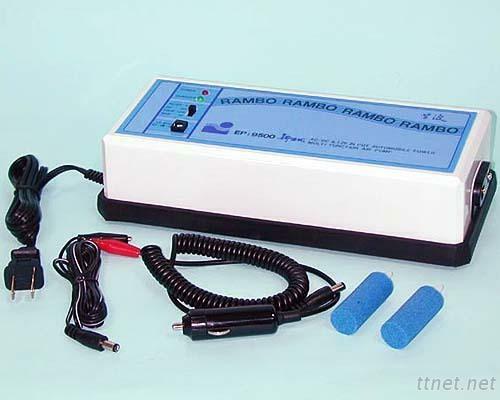 DC power supply is available in two steps: 6 hours (strong) and 10 hours (weak) discharging time. Low noise and long lifespan. For 24 hours continuous uses without adding any lubricants.